A by-election is in progress among the hereditary peers in the House of Lords to replace one of their number, Viscount Slim, who has died. 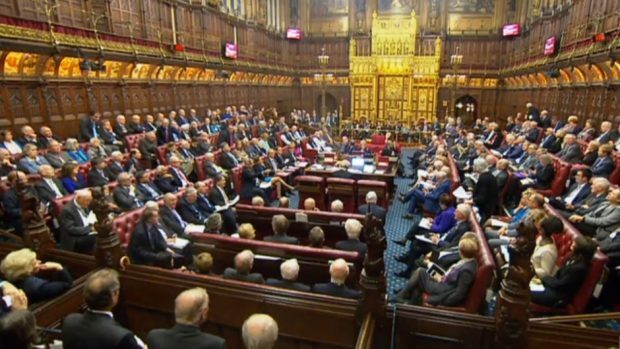 There are no less than 14 candidates – all hereditary peers – who are campaigning for the votes of just 31 Crossbench peers – themselves, of course, hereditary lords. The 31 ballot papers were issued last week, the returned papers will be counted, and the result announced next Wednesday. It would be laughable if it weren’t so serious. The winner of this joke election will cost the taxpayer thousands of pounds and will in due course have the power to change or even introduce laws which could affect all of us. Today, March 19, is the 470th anniversary of an Act passed by the House of Commons in 1649, abolishing the House of Lords. In those pre-Union days, of course, the Lords was a purely English institution, and in abolishing the Upper House, the Act of Parliament declared that “the House of Lords is useless and dangerous to the people of England”. Substitute “England” with “United Kingdom” and that sentiment could still apply today. Sadly, the abolition was relatively short-lived and the Lords was re-established with the Restoration of the monarchy in 1660. When Scotland and England were united by the Acts of Union in 1707, Scotland inherited the superiority of the Lords. And until the 19th century, it remained far more powerful than the Commons, a power which only began to wane with the passage of the Reform Act of 1832. The final nail in the superiority of the Lords over the Commons was hammered home by the pre-Great War Liberal Governments after the Lords rejected proposals to impose a land tax on landowners. Life peers were introduced in 1958, the year in which the first ever woman was admitted to the Lords, and in 1999 – astonishingly only 20 years ago – most hereditary peers were expelled, leaving just 92 of them, elected, ironically, by their peers. This last change was supposed to be temporary, with the Lords gradually moving to a completely appointed membership. However, since then nothing has changed. We currently have 650 members of the House of Commons, but (at the last count) 781 in the Lords, a reduction at least from the 1330 at its peak before the 1999 reform. Most nowadays are appointed for life by the Queen on the advice of the Prime Minister. However, there are still 92 hereditary peers and 26 “Lords Spiritual” – bishops representing the Church of England. It’s worth noting that of the 92 hereditary peers sitting in the House of Lords, only one, the Countess of Mar, is a woman. And no church other than Anglican is afforded the privilege of seats in the Upper House as a matter of right – no Church of Scotland representatives, no Catholic Church, let alone any religions other than Christian. Anyone looking at the UK’s electoral system from the outside must find it at best puzzling, if not completely anachronistic. We have the only supposedly democratic legislature in the world where membership of the Upper House is greater than the Lower House. The only legislature, certainly in Europe, where most membership is by appointment or inheritance rather than election. And only Communist China has a larger second chamber. Unlike MPs, peers are not paid a salary. However, they can claim £305 for each day they attend – tax-free – as well as travel expenses. Stories of peers leaving a taxi, running in to the House to register attendance, then exiting to the cab immediately, haven’t helped their cause. Indeed, the average annual expenses claim for each peer is almost £26,000. Each incoming government has the power to appoint its own representatives to the Lords (often simply on the basis of favours granted or donations to the party). However, there’s a convention that the smaller parties at Westminster are entitled to a number of Lords consistent with their representation in the Commons or votes polled in elections. Thus, there are Liberal Democrat lords, Ulster Unionists, Democratic Unionists, and one each from UKIP, the Greens, and Plaid Cymru. The notable absentee from this list is the SNP. They are opposed to the existence of the Lords and refuse to take seats there on principle. The argument against this stance is that while the Lords still has jurisdiction over laws which will apply in Scotland, the Nationalists should be there to state their case. This issue has been debated at the party’s national conference, with some senior party members speaking in favour of taking seats. However, this has always been rejected by the party membership. Reform or indeed abolition of the House of Lords is long overdue. A slimmed-down, proportionally-elected chamber, with members serving a fixed term, is certain to be introduced at some point in the future. Frankly, the sooner the better.